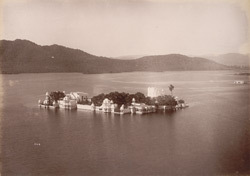 Photograph from the Curzon Collection: 'Views in Meywar'', of the Jagmandir Water Palace, Udaipur, taken by Deen Dayal in c.1890. Udaipur, is situated on the Lake Pichola, artificially created by the building of a dam wall between two hills. There are many island pavilions on the lake, the best preserved is the complex on Jag Mandir, built of sanstone inlaid with marble in 1551. The main palace on the island, Gul Mahal, was built in a Mughal style architecture by Karan Singh (1621-8). Most of the other buildings on the island are from the 18th century.